This won’t be an elaborate post, just a filling meal that makes good use of your leftover chicken from a roast. 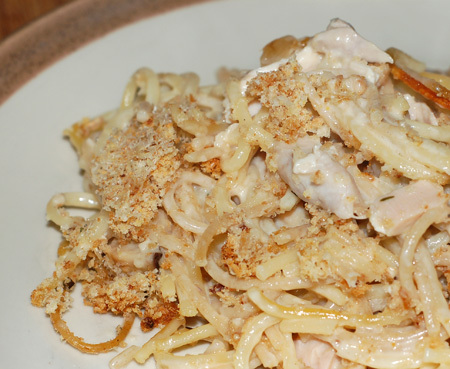 I don’t recall my mother ever making chicken or turkey tetrazzini when I was growing up, but if she had, there is an extremely good chance that the recipe would have called for canned cream of something-or-other soup. I liked this version because it allows you to make the creamy, mushroom-studded sauce yourself with pantry stapes; the original recipe even contains instructions for making the chicken stock yourself from bones, but we prefer my 18-hour crockpot stock over anything I could make in half an hour. I generally use reconstituted dried mushrooms for this recipe, as well as substantially less chicken, since I am working with the picked-over remains of a previous evening’s meal—we’ve never felt deprived, though. Make this with your leftover roasted chicken or turkey, or poach a few pieces of fresh chicken in store-bought stock to fortify it. This is a rich casserole, so serve with a light salad or some simply cooked veggies. Alternately, you could try substituting half-and-half or even whole milk for the cream, though I haven’t tried this myself yet. Put oven rack in middle position and preheat oven to 350°F. Butter a shallow 3-quart glass or ceramic baking dish. Melt remaining 3 tablespoons butter in a 2- to 3-quart heavy saucepan over low heat, then add flour and cook roux, whisking, 3 minutes. Add warm stock in a fast stream, whisking constantly, and bring to a boil. Reduce heat and simmer, whisking occasionally, 5 minutes. Add cream, Sherry, remaining 1/4 teaspoon salt, and remaining 1/8 teaspoon pepper and simmer over low heat, whisking occasionally, 10 minutes. Stir in the chicken pieces and the mushrooms, if using fresh. Cook spaghetti in a large pot of boiling salted water until al dente, then drain well. 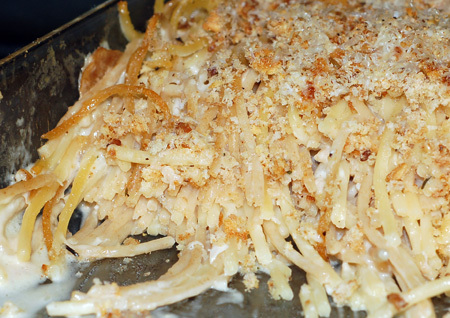 Toss together spaghetti with sauce in a large bowl, then transfer to baking dish. In a small bowl, stir together the bread crumbs and Parmesan; drizzle with truffle oil and toss with your fingers until the oil evenly coats the crumbs. (You could additionally season the breadcrumb mixture with freshly chopped herbs and garlic powder, if you like.) Sprinkle over spaghetti mixture. Bake until sauce is bubbling and top is lightly browned, about 30 minutes. Allow to rest for 10 minutes to set, then serve.